War-mongering Erdogan promises little girl "Turkish Flag on her coffin!" Erdogan put a little girl under immense psychological pressure in front of thousands of his cheering supporters and abused the child promising her a … honorable death! He told the sobbing girl that the Turkish flag will decorate her coffin if she will be a martyr for the country. 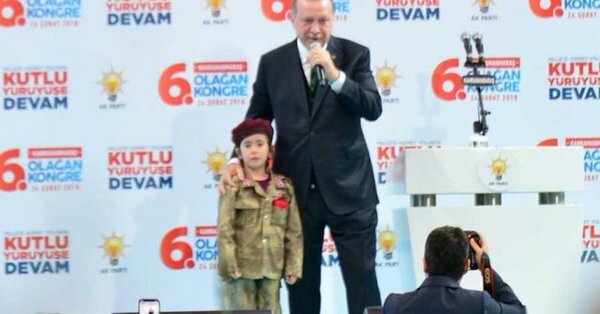 During his speech at the AKP party convention in Kahramanmaras province on Saturday, he invited a little girl dressed in military uniform on stage. “Yes” the sobbing girl replies. With ninety percent of Turks supporting the Turkish military operation against the Kurdish-controlled Afrin region in Syria, Erdogan has been using a more and more nationalistic tone in his rallies. Like other Middle-East dictators before him, he misuses children in support of Afrin “Olive Branch Operation” propaganda and it was just last week that several children in military uniform saluted the Turkish President during a speech in the parliament. The Turkish president did not scare only the little girl. He talked about mobilization of reservists and called on people to check on call-up orders for the military. He said he was ready to march with his people when the time comes. “We are on the eve of a new resistance. We will have a hot summer. After the meetings we are conducting with the military leadership, and if the people are called to mobilization, it will be first me and then the nation who will match together to the front” Erdogan said. 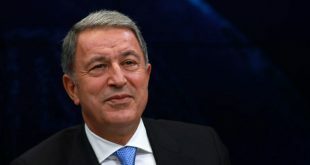 His announcement set thousands of Turks in panic who rushed to check on e-government websites whether call-up orders for reservists have been issued. All websites of Turkish e-government incl the one of Defense Ministry went down. 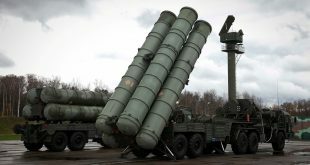 He lashed out at the US and allies and spoke of a “global anti-Turkey propaganda based on lies and fake news.” Supporters of terrorists post fake pictures on social media in attempt to defame Operation Olive Branch, he said. In the same tune, Urban Minister Mehmet Özhaseki says the Turkish government has dealt the biggest blow to US-led anti-Daesh coalition. Being under pressure by the US on Syria and by Europeans on Greece and Cyprus, Ankara’s top politicians in mass hysteria are firing ‘warning salvos’ at all directions. Turkish Foreign Minister Mevlut Cavusoglu warned European states to stop messing around Turkey. “There will be no security and stability in Europe without Turkey,” he said. Turkey must be feeling terribly alone for the time being. Meanwhile, the Dutch Parliament recognized the 1915 massacres of Armenians as “genocide”. “The decision is nonbinding; it is a reflection of hostility against Islam,” Cavusoglu said. Erdogan he is not going to do nothing. Everything he does is for his political purpose. Do not worry Greeks never will be war between Greece and Turkey. We did not had a war the time Turks occupying Cyprus. And if they want a war we are ready and they are going to loose their country. Nobody wants war today. Today is the beginning of the nations on Earth for space exploration and colonization other worlds out there. Wake up humans. Do not let a few assholes making money selling weapons to push you on war. Erdogan is a clown and he turned Turkey into a joke. He lies, threatens and locks the opposition in prisons where they are tortured and some even dissapear forever. What this guy needs is a bullet to the head. I agree Erdogun is a clown, but a dangerous one. 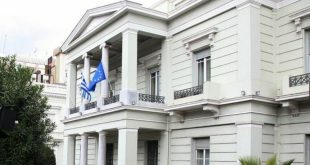 Do not underestimate for a war between Greece and Turkey, however, it will be brief and Turkey will lose.